Alfa Romeo factory service manual for the Alfa Romeo GTV and Spider produced between 1993 and 2004. Technical data covered related to engine, clutch, gearbox, front axle, brakes, steering and suspension. The Alfa Romeo GTV (Gran Turismo Veloce—English: Fast Grand Touring) and Alfa Romeo Spider were two sports cars produced by the Italian manufacturer Alfa Romeo from 1995 to 2006. 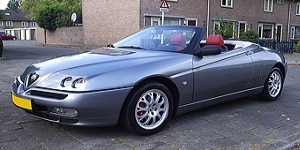 It is also known by Alfa Romeo's internal designation 916. The GTV is a 2+2 coupé, and the Spider is a two-seater roadster version of the GTV. Around 39,000 Spider and 41,700 GTVs were built from 1993 to 2004. The GTV's name placed it as the successor to the long-discontinued Alfetta GTV coupé, whereas the Spider was effectively the replacement for the then 30-year-old 105-series Giulia Spider. The GTV was available until the launch of the Brera in 2005, while the Spider lasted another year until the launch of its Brera-based successor in 2006. Alfa Romeo GTV is claimed as the best sport car by Jeremy Clarkson in 1998 and is listed at no. 29 in Top 100 Cars from 2001.